Release Date: November 30th, 2013. The butler goes to the corner of the room where a small stand holds a glass carafe of water and crystal goblets. He pours some and hands the glass to me, then exits the room, clicking the door quietly closed behind him. I take a shaky sip, and my parched lips scream with relief. The cool water helps to alleviate my perspiration as well, which has already thoroughly embarrassed me. “Welcome, Dorian,” says the man seated behind the desk. He is large and stocky, with a bald head and bad skin. He observes me through black, beady eyes that don’t seem to blink. “I am Mr Black, and this is my colleague, Mr Red.” He indicates the man flanking his ornate leather chair. Mr Red nods at me slightly. He is reedy with delicate wireframe glasses perched on his beaky nose. “H-hello,” I stutter, biting down nervous laughter at the absurdity of their names. My hands tremble so badly I am very nearly spilling my glass of water. I set it down gingerly on the small table beside my chair. “We understand you are here because you’re interested in becoming a member of our prestigious organization,” Mr Black begins. My saliva dries up, making my tongue swell like a blowfish and stick to the roof of my mouth. Jack of all trades, master of none – save for the art of procrastination – K. Baskett lives by the motto, “Never do today what can be put off until tomorrow.” K. firmly believes that you aren’t really interested in the author’s hometown, spouse, children or pets, and has therefore decided to spare you the details. No Greater Illusion is the author’s award-winning debut novel. 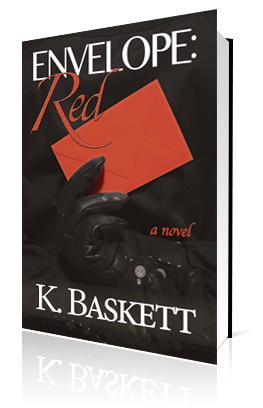 Envelope: Red, the second offering, is a gritty suspense-thriller releasing November 2013. Thanks for having K today! Hi Karen, I appreciate the support! @bn100 Thanks for checking it out!